I mentioned in April that I was thrilled to discover the website Booksneeze! This website offers the opportunity to receive free books in exchange for honest reviews from bloggers. I was excited to find this site because as y'all know I do love reading and what a great opportunity! I also appreciate the opportunity (as a writer) to examine someone else's work! There are so many talented writers in our society! *smiles* In April I did my first review for them on the book: Days Like These: Even in the Darkest Moments, Light Can Shine Through by Kristian and Rachel Anderson and today I am excited to share my review of the book Notes from a Blue Bike: The Art of Living Intentionally in a Chaotic World. This book is filled with stories. Stories of life. Stories of choices that we make. Stories of longing to live intentionally in this world and to make a difference. 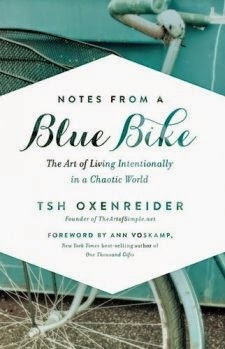 Tsh Oxenreider (the author of the book) takes us through her own personal experiences of living all over the world (including places like Russia and Wales) back to the United States while examining the idea if it is possible to live with intention (and grace I might add) in this fast-paced culture that we live in. While the concept of the book might not be new (I think this is a question that we all have examined at one point or another) her writing style is delightful and her stories create a backdrop that allows the reader to consider her words on a deep level that stays with you long after you have put the book down. The book is complex in its ability to touch at the heart and soul of all who read it. No matter who you are ... we all have dreams and relationships that we may have sacrificed trying to keep up with the "status quo". This book is inspirational and inspired me along my own journey right now to not get caught up in "status quo" but to keep seeking out where the Lord wants me to be and who the Lord has put in my path right now for me to love. On a personal note it was very interesting to read this book right at this time period. When I received this book I was in the middle of a similar conversation (of choosing to live intentionally) with a blogging community whose membership I had been apart of for a year. I was "removed" from because I didn't "write enough posts each week". When I had tried to speak with them regarding my health issues and the focus that I am putting on that and the relationships in my life I was informed "I did not have pride in my blog". I was told that this group had "reviewed my blog" and did not find it "acceptable". I tried again to explain that I was struggling with Cancer and Advanced late stage Lyme Disease and was informed that those that had "reviewed my blog" had no time to read through each person's History. I was informed that I "did not live up to their standard of living and that my blog was a reflection of that". It was crazy, hurtful, and made me think for a couple of days. It was also extremely disheartening to hear that to this particular group (whom I had previously thought was more about people and relationships) thought this way. And it was at that point freeing to realize that we were on completely different paths of what we each felt is important. I wish that particular bloggy group well and pray and hope that the choices that they make will bring them the peace and happiness (and some rest as they told me that they are "extremely exhausted" from all of their commitments). It was also a huge reminder to me as I go forward on my healing journey of choosing the priorities that are intentional. Because I truly believe that people do want to live with intention and not just "live busy". "More than anything, living according to my values and my passions in the real world means extending grace upon grace to others when I intentionally live differently. The same goes for you as well. ... (and) that's okay. Love them, show them grace, and walk through life with a teachable spirit, freely knowing you don't need their approval in order to live consistently with your values." (page 208) Love this! We can live our lives in freedom as seek to live intentionally and extend lots of grace on our journey's in the process! If you are looking for a great read as we approach summer I definitely think that you will enjoy this book! In closing I will leave you with a quote from Shauna Niequist, one of my favorite authors, who had this to say about the book (and I couldn't agree more! ): "Tsh has a gift for making what's hard feel doable and what's overwhelming feel manageable, like a smart friend you meet for coffee and wisdom. I feel understood, and at the same time, inspired to live with more intention and creativity." Amen!Thank you for a wonderful book Tsh Oxenredier! I would love to hear how y'all choose to live with intention each day? What are things that you do to protect yourself from living chaotically in this busy world? I use to do this but totally forgot about this site. thanks for sharing again.